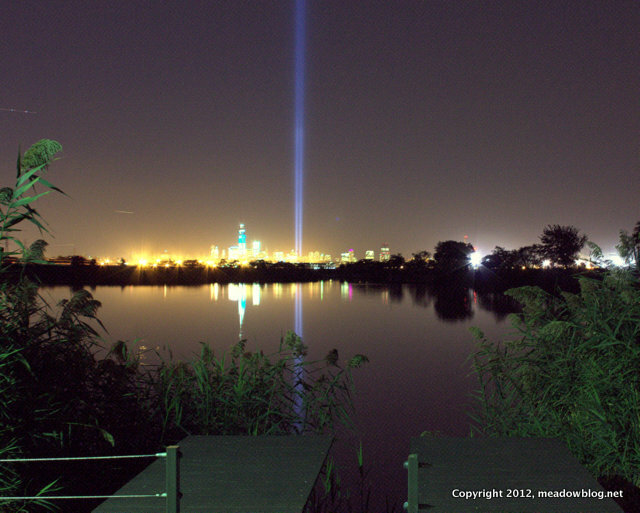 The view of the twin beams of light in Lower Manhattan, seen from the World Trade Center Memorial Cove, DeKorte Park, Lyndhurst, N.J., Sept. 11, 2012. The Record's Mike Kelly interviewed Mike Maddaloni — who organized tonight's informal gathering at DeKorte Park to view the Twin Beams of Light — for the columnist's front-page column on Lower Manhattan's new skyline. 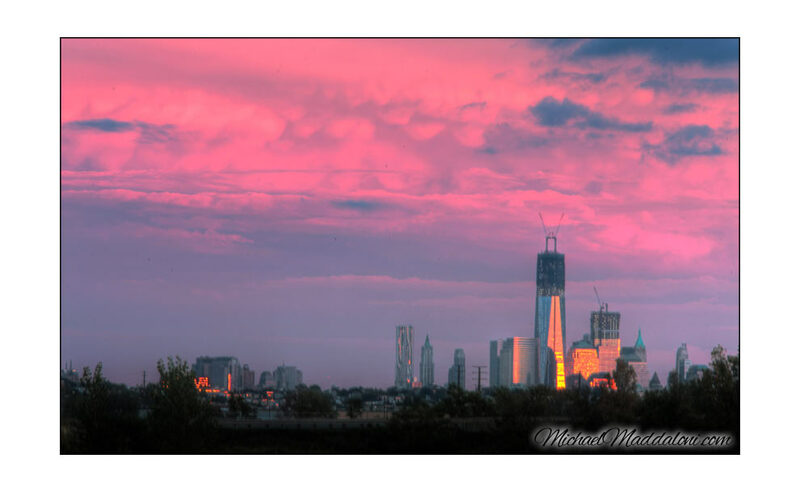 A link to Mike Maddaloni's photo from the column, of 1 One World Trade Center from DeKorte Park, here. Another of Mike Maddaloni's photos of the new skyline is featured above. Tonight around 8 p.m., a few folks are planning an informal, unofficial gathering in the Visitors Parking Lot at DeKorte to look at the Twin Beams of Light in Lower Manhattan. "Thursday night I stayed a bit after dark, chatting with a few other photogs, and lo and behold I saw a sliver of light in the sky. "We waited until it got darker, and sure enough they were testing the beams; they seemed a bit duller than usual so I'm holding out till Tuesday for a proper shoot. But I was able to test it, and with the still water from the parking area, its a GREAT spot, reflection in the water, the turnpike really doesn't do much damage to the shot. Thursday: ‘Lost Bird Project,’ and It’s Free! 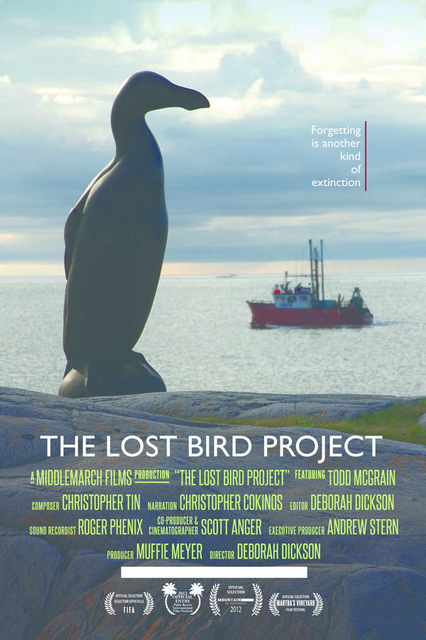 Only two days until the free screening of the acclaimed new documentary film, "The Lost Bird Project,"about the stories of five birds driven to extinction in modern times and sculptor Todd McGrain’s project to memorialize them. 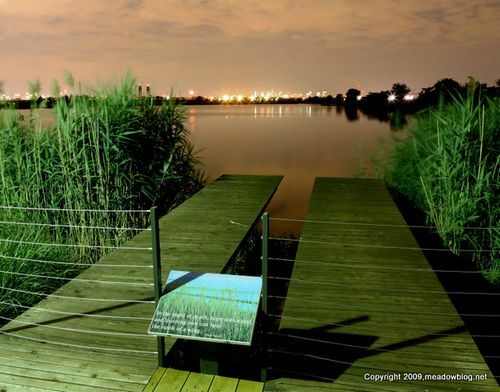 The event is on Thursday, from 7 to 9 p.m. in the Meadowlands Environment Center in DeKorte Park, Lyndhurst, New Jersey. The Meadowlands Commission, Bergen County Audubon Society, Ramapo College and the New Jersey chapter of The Nature Conservancy are proud to sponsor this special screening, along with a question-and-answer session afterward. 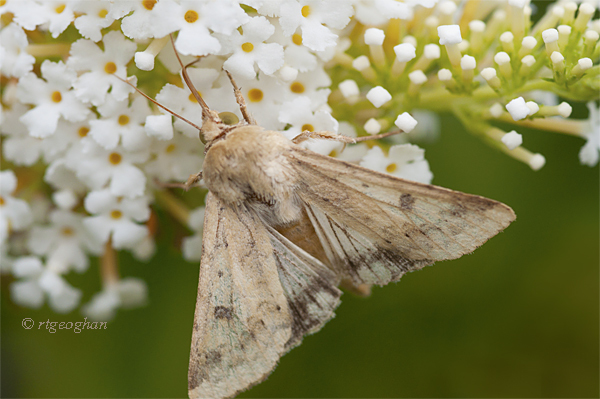 Regina Geoghan photographed this moth at the Butterfly Garden — about the size of a Silver-spotted Skipper and fast-moving. 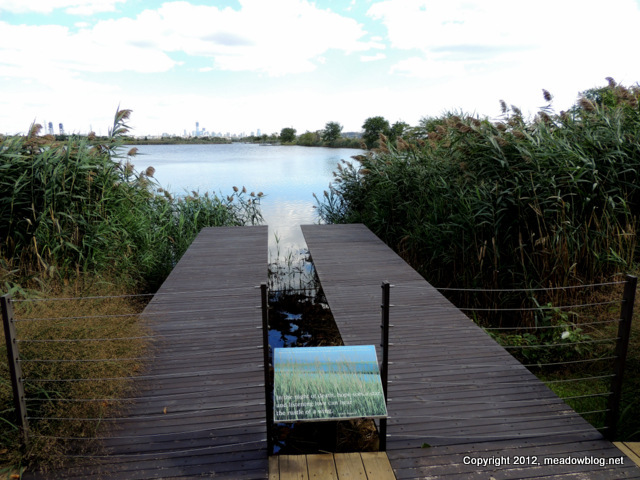 DeKorte Park is home to the World Trade Center Memorial Cove, next to the NJMC Administration Building and facing a Manhattan skyline that once prominently featured the Twin Towers. The memorial features two wooden piers suggesting the fallen towers. Each pier is composed of 110 boards, each symbolizing a floor of the buildings. Nearby, a steel silhouette of the pre-9/11 skyline recalls the view before the attacks. "In the night of death, hope sees a star, and listening love can hear the rustle of a wing." — Robert Ingersoll. Below, a time-lapse photo of the Memorial Cove at night from 2009.